I once heard someone quoting something I agree thoroughly – “If you are a complete idiot, is it that required for you to open your mouth and let the world know about it?” But hang-on, the issue is not with one being an idiot. After all each one of us can’t be smart or at least not an idiot on entirety. Few definitely would remain idiot and that’s how Mother Nature balances things. The issue is with the easiness one flaunts his/her idiocy, leaving no doubt on the minds of the rest about the person’s fractured mental state of affairs. That’s when things become, well little hilarious. Post UP catastrophe, one would think a lot would have gone inside Congress think tank on how they would want to consolidate their future election campaigns. Anyone would expect that, looking at the quality of drubbing they got. I was with the same impression till yesterday. When it was first told that Rahul Gandhi won’t be seen campaigning in Gujarat, I thought this to be a judicious step by Congress. By stopping this chap from venturing out and cracking jokes atop the stage, they have made sure he won’t screw up whatever minimal chance the party holds in the state. Walking their talk, which is very, very rare and pretty much Congress unlike, they actually stuck to that. For the best part of Gujarat election, they never had the prince cracking anecdotes all around. They had people like Beni Prasad Verma, Ahemad Patel, Manmohan Singh, Sonia Gandhi and hell even Manish Tewari but no prince. That was quite an achievement knowing very well how the sycophants go crazy by the mere mention of the letter ‘R’. Honestly I was sad on the scheme of things. 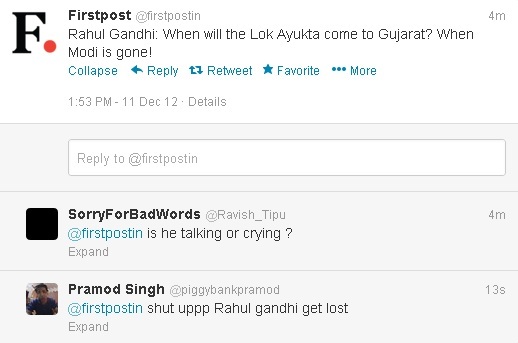 For me the whole Gujarat election campaign was looking lackluster at the onset of that missing humor quotient. It was all serious business with no-nonsense character like Modi around. Though Manmohan Singh and Sonia Gandhi did their best to bring in that humor, but compared to the king of comedy, they failed miserably at that. Though terming Gujarat roads are bad and there is no development in the state are kind of jokes that would make people laugh for a week without break, but still they are no match to the quality of gags Rahul baba cracked during UP or capable of cracking without putting any effort whatsoever. Even poor Manish Tewari, who at times has given Rahul baba a run for his money with his jokes, also failed badly. I guess Congress party heard me and my plight. After all it is the only party which cares for the poor. No? Finally, they realized, it is no point having a serious election end-to-end, barring occasional outburst of thunderous laughter. Just when we all thought this going to be a Rukhi-Sukhi election, they pressed into service their trump card; their game changer ideas factory; a man whom we can safely confer with the best standup comedian of the globe award, without raising a single eyebrow. And boy, didn’t he live up to his reputation of being the best comic in the political spectrum with his very first appearance? Look at this one. This is nothing less than a masterpiece – ‘We knew a lot would be unearthed by RTI’. We are so fortunate to have people who will first loot and plunder the nation and then let us have a reasonably toothless weapon and want us to do all the running to unearth them. No, this is not the only thing that is bizarre in this statement. The prince chest beats on the power of RTI so much so to even unearth the scoundrels of his party but can’t urge his party men not to loot at the first place. 2G, CWG, Adarsh, Coalgate, Irrigation scam, Bofors scam are certainly the entities which our joke cracker urges all of us to unearth by letting our voices heard through RTI but won’t urge people like Raja, Kalmadi, Chavan to stop pillaging first. So guys, the loot will go on, since moral obligation is not that important for Rahul baba; what important is we must be heard through RTI and that is precisely why congressmen are busy in burglary so that we will learn our rights and the tricks of RTI and how we can file one of them to send the thugs packing. Hence try to get the pious idea behind all such loot. It is for our own good only. Though the prince might never have talked with a Gujarati in last couple of years, by sheer magic he knows how Gujarati are never heard by Narendra Modi or his government. This is only expected of someone possessing some high quality IQ and unbelievably powerful sixth sense to judge the root cause just by looking at the face. I have a question here for the prince. What about the government or the chief-ministers in Congress ruled states? Some light thrown on them would help us equate the so called precarious situation prevailing in Gujarat better. Does Shiela Dixit listens to people of Delhi? Honestly, the capital city is so overcrowded by these political clowns that one hardly recognizes Mrs. Dixit, let alone expecting her to listen to your urges. Half the city of Delhi suffers through acute water and electricity shortage while the politicians enjoy free electricity with unpaid bills amounting well into crores. Where is the concern for the common man here? Does she listen to the plight of poor vendors and homeless when the anti-encroachment team pounce upon their livelihood and worse letting lose the notorious Delhi Police on the protestors with water cannons. This definitely is a great example of listening to the common man’s plight. Modi certainly didn’t listen to people by floating schemes benefiting farmers immensely; Modi certainly overlooked the voice by having schemes to educate each one of the girl child; Modi certainly was arrogant when he took up the Savarmati cleanup process on war footnote, which increased the property value in and around by some margin; Modi certainly is a danger to people’s voice since he did took measures to make the roads transport friendly. Seriously Modi is a joker in comparison to many of his Congress counterparts. No? This one is a blatant lie. I am no political pundit but going by Wiki I think the script writer of Rahul baba needs some serious schooling from the likes of Derek O’Brien. As per my knowledge, Gujarat was the fourth state to include Lokayukta in their framework. And who by the way floated the idea of Lokayukta? Chacha Nehru? Though his party ruled 90% of the period, post our independence, Rahul baba doesn’t have anything credible coming from their ruling to lambast Modi but have the idea of Moraji Desai for it. Well sleeping or dreaming of sleeping with all the beautiful women of the world is certainly not governance and while the act might produce few babies but not a nationalistic idea like Lokayukta. Here I have another question for the prince – when will Lokpal come into picture? When Congress goes from the center? Just because Lokayukta fits best to your need to blast Modi, it certainly becomes an important cog in our system but not the other path breaking idea that Moraji Desai suggested alongside by the name Lokpal. How come I don’t see the love for Lokayukta in the Congress ruled state Maharashtra where it is considered the weakest because of rampant political interference? And where it is strongest? Well, in Karnataka. Definitely a Congress ruled state. No Rahul baba? I will give this one to the prince. 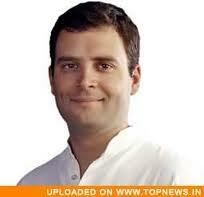 Finally I got to know, there at least is something that hasn’t happened because of Gandhi family alone. From our technology advancement to our nuclear weapons; from our space research to our missile system; all because of Gandhi family only. Dr. Kalam is a useless bot, just there for namesake. We only respect him because we love his hairdo. I don't complain though since at last it is an eureka moment for me to know the phone that I hold in my hands is not because of one XYZ Gandhi but a certain Satyanarayan Gangaram Pitroda. So Congress unlike Rahul baba; I must say when you so conveniently gave away the hard earned credit of your forefathers to this Pitroda chap. Hope his sycophant followers don’t object to their master himself. By the way, I hope Rahul baba knows, SamPitroda though is a Gujarati by birth but born, brought up and lived in Titlagarh, Odisha. No words for this utterance. For records, marketing is something that a whole brigade of rear lickers are doing for Gandhi family since 1947. Modi doesn't require any kind of such advertisements. His work, his development and his governance speaks for themselves. Let this be clear before we move forward. That said I still will pledge Rahul baba to roam around his backyard and ask people of Delhi to get the idea of their water usage habit or rather the forced habit. Forced because, barring couple of hours in a week most of the households have to manage with their own sweat for the rest of the period. And by the way some one educate Rahul baba..Err.. his script writer that not long back in 2011, the government in center only awarded Gujarat government for showcasing the best water management among all states. And just within a year they become horrible with their water management all of a sudden for Rahul Gandhi? If so then it casts a doubt on our government sponsered awards altogether. While I am at it, I need a little update – Is the Prince going to tear apart BJP manifesto today at Jaamnagar? Or he has already done that? I live in Maharashtra - a state where Congress has been ruling since last 8-9 years. Water management here is so good that we get 25 mins of water in a week. Even in rainy-season. Please tell someone to this Gandhi-scion. Sir, I live in USA and I do salute you for your blogs. I am a great fan please keep writing. When will Indians learn self respect, dignity and patriotism. We've 1 billion people and still we can't find a way to get rid these Rothschild stooges ( Sonia, Rahul...congress). The day we come out the slavish mentality, we'll strive and improve, the day we think using our brains and not balls, we'll make progress. Until then the political parties and politicians will continue to unleash the weapon of cast , religion and 'divide & rule' politics. We need a rude awakening. Our country has become a laughing stock, go back to the history and see what we've given the world. It's time to clean up the mess... no matter what path you need to take. It's now or never. are you Karan Sharma ?